WARNING: The information below is intense and it may offend some with conditioned thinking or certain religious beliefs. Please read with an open heart and open mind, and if for some reason the information disturbs or angers you, please stop reading and center yourself… a negative reaction affects us all which is counter-productive to the purpose of this message. 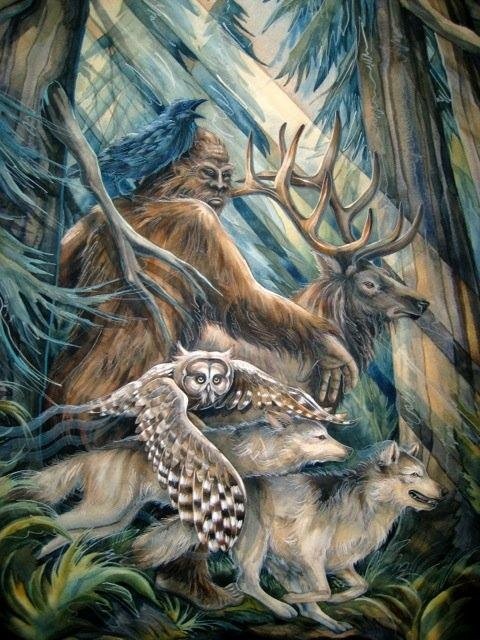 Although some call him Bigfoot, Yeti, Yowie, Babaloo, Misabe, and a variety of other names, I call him Sasquatch, one of his most famous names, coming from the Coast Salish language of so-called BC. I say him, although this specie of two-leggeds also has genders and families, but the ones who choose to show themselves and interact with us Humans are most often wise older males, protectors of their tribe. Two previous encounters and lots of research in different sources, including many accounts from Native traditions, had awaken my interest in this mysterious being. Two close encounters this spring with direct communications brought me many clear answers and teachings. In May, on Vancouver Island, prime Sasquatch country by excellence, one week after finding tracks by Clayoquot, I did ceremonies and chants echoed in the mountains around Kennedy Lake. That night, a loud bang sounding like a big trunk being hit with strength on a hollow tree, caught my attention; then, another one closer. Then a big tree being shaken and broken, and another one closer, made it clear as to who it was. When I heard his foot steps coming my way, I knew he was coming to meet me. He stopped and sat just a few yards behind my tent. After delivering this message to me, Sasquatch left in the dark night, through the thick brush behind my tent, leaving a trail that I could see in the morning. All fear had left me. I rather felt a great joy and a profound serenity, and for my new ally, much respect, sympathy and a powerful spiritual connection. But at the same time, I was feeling a certain sadness about the way our Human people has lost its spiritual ways and has treated our elder relatives, and felt overwhelmed by the tasks awaiting us ahead. The next night, I was expecting another visit, but felt he had gone far away, because other campers had arrived. While calling on his spirit, testing to confirm the connection he had promised, a whirlwind came around me and stopped by my side, and a friendly whisper was heard near my ear. The following night and the day after, as I was getting ready to leave, we exchanged vocal calls across the forest. The last one sounded and felt like a female greeting me, with higher pitch and tone, and a different voice. When I returned to our Human world, I realized that I couldn’t share these stories with just anyone. Most Human people would take me for a liar or a nut case, had they heard any of this. Then, on my way to the gathering in Lillooet, I met many Natives. Sasquatch was mentioned by someone before I did. I soon found out that among the St’at’imc and other BC Native communities, Sasquatch stories are common and many have an uncle or a cousin who had encounters with him. At the Indigenous gathering, everyone I shared with about my Sasquatch encounters was open and interested. So this made me understand that in some spiritual circles, teachings of this nature can be shared. This inspired and motivated me in sharing with this community, these experiences and the knowledge they provided. After this, I went up north, above the 56th parallel, some 300 km from Yukon. The first day of mushroom picking in the deep bush, I came across a dozen of clear Sasquatch tracks, well printed into the charcoaled soil. They were about 16 inches long, bigger than the ones I had seen on Vancouver Island, with a definite human foot shape with five round toes. I shared my discovery to a couple friends who brought it up at camp. The general reaction was the usual laughter and bear explanation, although another picker admitted having seen tracks as well. I succeeded in explaining that Sasquatch is a very well-known being in the stories of many Native traditions, especially in BC. But I knew I couldn’t mention anything about my encounters there, without being met with ridicule and seen as a weirdo. The next day, as I had walked kilometers in the burnt forest, Sasquatch showed himself to me in the physical form. I first heard a sound, like a mixture of gentle groans and mumbling. The closest sound I can compare it to, although it might seem funny for some, is the voice of Chewbacca in the Star Wars movies; and you can bet they took their idea from somewhere. I lifted up my head and looked towards where the voice was coming from. And there he was standing, some 200 feet from me, beyond the pile of uprooted trees, with nothing standing between us, so that we could exchange a clear visual contact. He was over 8 feet tall, with light brown long fur, taller and slender than the black one I had seen on Vancouver Island in 2003. Although impressed, I was filled with joy, like if meeting an old friend. Seeing I was without fear, he was puzzled and shyly crouched behind a big uprooted stump. I could see his face between the roots, observing me with curiosity; a sentient face coming from ancient ages, made of intelligence and sensibility, profound wisdom and deep instincts, strangely human and wild. Although he had a few centuries of age, he was not an ancient learned elder of his people, but he was a leader of his local clan. So I waved at him and started singing a gentle chant, knowing that they love soft music and chants from the heart. He had only been seen by a few Humans in all his life, but all of them were afraid of him. Now he was meeting one who was a friend, what he found interesting, but strange, compared to the usual hunters or loggers he had seen. He wondered why I was coming with this wave of people picking all the mushrooms and invading his woods in an unprecedented manner. I couldn’t pretend that I was gathering my meal nor wildcrafting, so I explained to him that we exchanged the mushrooms for money, so that later we could exchange the money in the Human world, for other goods we need for our survival. He had already picked up this strange concept from reading the minds of the pickers. But what he couldn’t figure out was, how come I was the only one of my people who could communicate face to face with him, but was doing the same thing as all the others. This had me ponder, then and afterwards. He finally told me that he was glad to talk with a Human, but there was too many of my people invading his woods who couldn’t relate with him, so he couldn’t stay around in a visible form. And before I knew it, he had disappeared from my sight, suddenly vanished. That night, he came to me in dream and I saw clearly his face smiling over me and thanking me for the chant. The next day, I went in another area and found again some tracks, but a couple inches shorter, from another member of his family. The following day, I returned to the sector where I had encountered him. After a whole day of picking a modest harvest, I was getting ready to return to camp, as the long northern daylight was already dimming out, when I heard the same recognizable voice trying to mumble a shaky melody. After two or three attempts, I understood that he was asking me to sing again. So I started with a soft chant, to which he replied with a few joyful whoots. After my chant, he tried again a melody, sounding like a clumsy mixture of groans and howls. I did again a mellow chant and he tried to join with his vocal sounds. This amused me, as it felt like a sacred spiritual connection, which at the same time was also somewhat funny. I chanted the first line and stopped, and he tried to repeat it. We repeated the same exercise a few times, until he finally succeeded in howling the right notes in the right order, which made us both very happy. He explained to me that his specie communicates through telepathy and has no need for words and speech, so individual Sasquatch don’t have any specific names to designate their person. Being telepathic, they don’t need to introduce themselves to each other, nor can they lie about themselves. But they use different vocals to express their emotions or communicate their location, either to their own people or to other species who can’t communicate with telepathy. They can whisper, whistle, hum, mumble, moan, groan, growl, howl, whoot, roar, scream and mimmick certain animals and birds. But they have not developed a musical culture nor a tradition of songs among their people. The sacred chants and spiritual music of the Humans is one of the things they appreciate, admire and miss the most from our people. Musical instruments are among the Human inventions that they value above modern technology. He had known of these things from the greater Soul of his specie, but had not yet heard music himself or experienced prior conversation with any of our Human people. As other means of communication, they also have glands that exude a pungent stench unbearable to most species, acting as a repellent for intruders. But they use those only in cases of danger, when they feel a threat. So I never got to smell their repellent scent, made famous through countless accounts. They can and have operated high technological devices and space crafts requiring logical understanding when in situations where their help was needed. But their specie has not developed any technologies nor external material tools; neither have they developed artistic creation, culture, nor the ability to play music and sing, having no need to create tools and produce art, as they can project their thoughts. Their primal wild lifestyles may seem raw and primitive for us Humans, but their extended knowledge of the Cosmic Order through their telepathic connection with the greater Soul of their specie and their psychic abilities to project images and energies directly into the minds makes their intelligence greater than ours on some levels, while Humans are gifted with speech, creativity, art, inventions and cultures. So when their people and our people were still connected, it was a beneficial exchange for both sides. As younger brothers, us Humans can also contribute to the well-being of our elder brothers Sasquatch. We thanked each other for this conversation and, as he knew I was on my way out, he bid me farewell. He explained that he had remained invisible during this last meeting, as the woods around were getting invaded with some of my people who couldn’t relate to him. So he couldn’t remain around any longer as more pickers were moving into the area. But he said that we could always remain connected in spirit. Now that we were friends, he would recommend me through telepathy to the greater Soul of the specie. This last encounter made me understand how each individual Sasquatch has a different personality, that connects in its own way and on different levels with the greater Soul of their specie, like to a matrix binding them all. They don’t have all the same experience, feelings and wisdom, but they all can access their collective knowledge through the greater Soul of their specie. It is comparable somehow to us Humans tapping into the internet, to share news or learn what happens elsewhere, except that when Sasquatch connects with their Mother Soul, they can’t lie or hide any intentions from their people. Their medicine is that of transparence and honesty. So this Sasquatch could see and know right away of my previous encounters, but he was more interested in communicating for the first time with a Human on a friendly level, than in teaching me about their history that had been previously transmitted to me. The information that he shared with me about their people was adding various new elements to what I had already been taught, concerning their personalities, emotions and perceptions of the Human specie. It also instructed me on their love of spiritual music as one way to communicate, apart from telepathy. If you run into Sasquatch some day, do not deny, hide, or fear; open your consciousness to the message their Soul carries. And if you find nothing better to do, sing a loving spiritual chant from your heart. Our Family of conscious two-leggeds and intelligent earthlings is far much wider, wiser, stronger and more ancient than it is generally believed in our young remodified cultures. We have some allies on this home-planet, as well as in the heavens, who are willing to help and waiting for us to reconnect with our spiritual knowledge, to bring the changes needed in our healing process and restore the Cosmic Order.